Anyone who’s followed my postings on A Gardener’s Delight, or who knows me in person, clearly knows that I’m a huge fan of water gardening. And I love to change things. Mostly I write for you, because if I can design and complete a project, so can you! Earlier this Spring, while going through some of the items that had collected in a storage area under our deck, I found a pre-formed plastic waterfall basin that was left over from the Ponds Project and not being used. 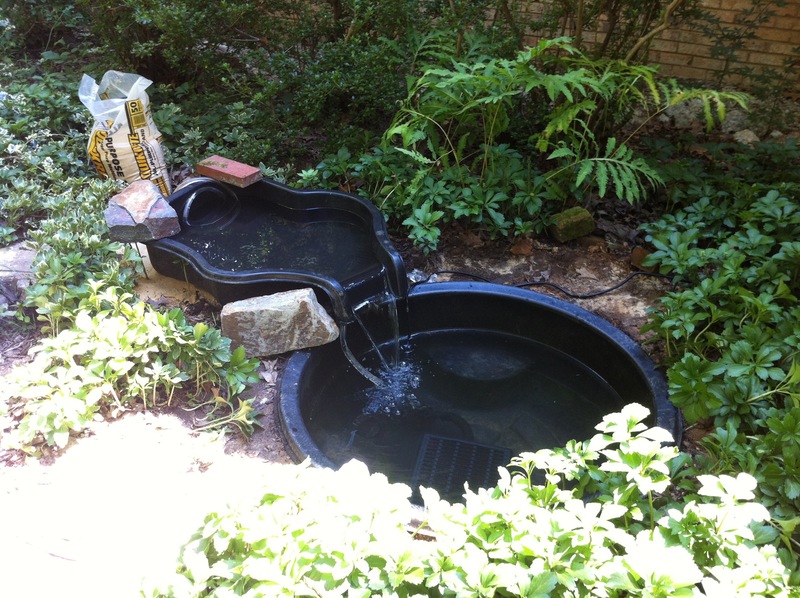 Rather than disposing of the waterfall basin, I decided to redesign the very first pond we’d installed at our Virginia house. 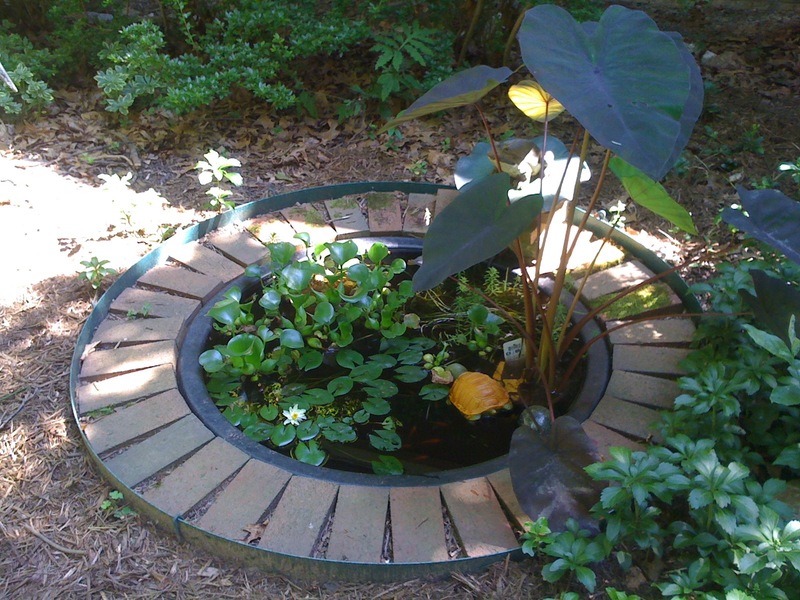 Our first water gardening project was a little circular pond — very elegant and based on a style that I saw in a mansion garden a few years ago. Its shell is preformed plastic , three feet wide and two feet deep, with three built-in plant shelves. 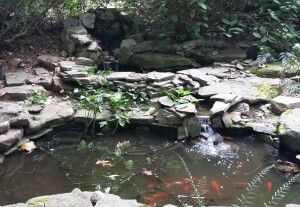 I’d always wanted an outdoor pond with fish. Since we’d had the front walk redone that year, we thought it would be lovely to install a pond as a focal point on the way to the front door. 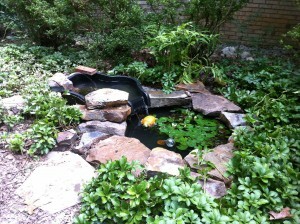 We installed the pond and I circled it with red bricks. A frog spitter added a moving water sound which immediately attracted frogs and dragonflies. We could hear the sound of the water from our bedroom window. A nice addition to the already lively nightly Nature symphony. The front pond – as it was originally installed. Over the years, the spitter tended to be bumped around by local wildlife that were attracted by the moving water. We’d regularly find the water spitting outside of the pond’s perimeter. After a few times finding the pond half-full, I turned off and removed the spitter for good. The spitter would have worked well in a much larger pond, and was designed to float around on top of the water. Just not an option for my current small pond with a side mounting. I replaced it with a small fountain and tiny filter that tended to clog up quickly. The three adult goldfish and the one small fry were looking a bit lethargic. 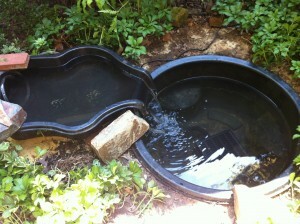 I knew I had to find a quick solution to my water gardening project’s issue. This week, after some research, I purchased a new pond filter and pump that is bigger but with a low profile and will allow the pump to work better — requiring less cleaning by me. (Always a plus!) This pump and filter system also comes with several fountain heads. I didn’t use the fountain heads this time, and will save them for another project. Since I had the extra waterfall basin, that was going to be my answer — add a waterfall to the existing circular pond! Your fish will fare better if you provide an oxygen addition to their water. Either a spitter or fountain will help add oxygen to the water. My new waterfall will act as oxygenator. 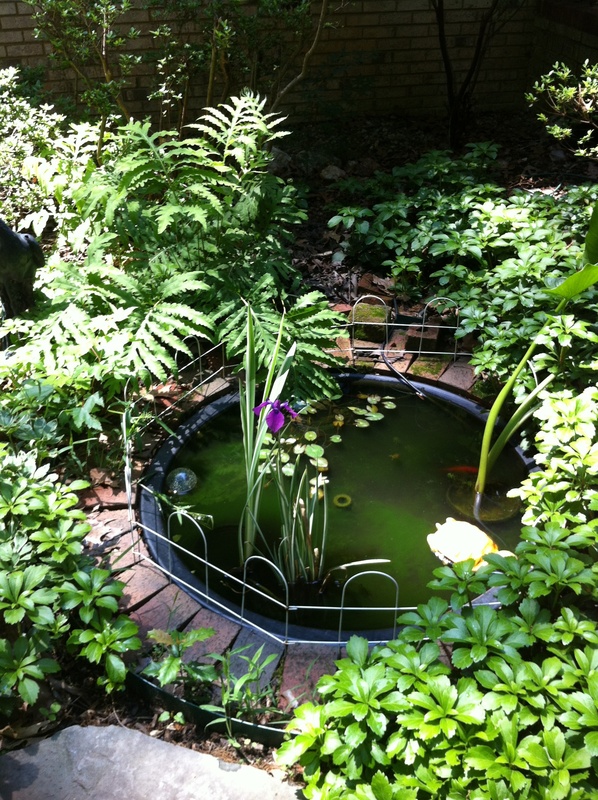 I caught the four fish and placed them and the water lily plant and some of the existing pond water into a large rectangular plastic basin that we had available. I added some fresh water. We have a water well which has great water quality. You will need to let the water sit for a while if you are on city or county water that’s treated with chlorine to let the chlorine disperse. 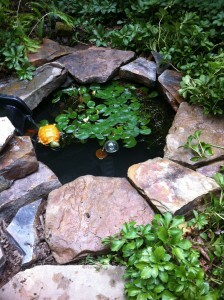 Left over from the previous Ponds Project, I had a whole pallet of special stone that I’d purchased a while back. Since it’s a very decorative locally sourced stone, with reds, grays, and beiges, I’d wondered what to do with it. A showcase front pond with waterfall was my answer. After cleaning out the circular pond, and disposing of the three inches of “fish emulsion” sludge at the bottom (add water and use the fish emulsion as a fertilizer for your garden), I spread some sand on the level ground, ensuring the waterfall would fall from a few inches above the circular pond’s water level, and I seated the waterfall basin as level as possible. I set up the new pump and filter, added water to the pond and waterfall basin, added a flexible plastic tube to reach from the pump to the new waterfall basin, and watched the water flow freely. Earlier, while cleaning out the existing circular pond, one leopard frog just didn’t want to leave the pond. It kept jumping back in, and I kept catching it and taking it out again. It eventually decided to stay away while I was working. 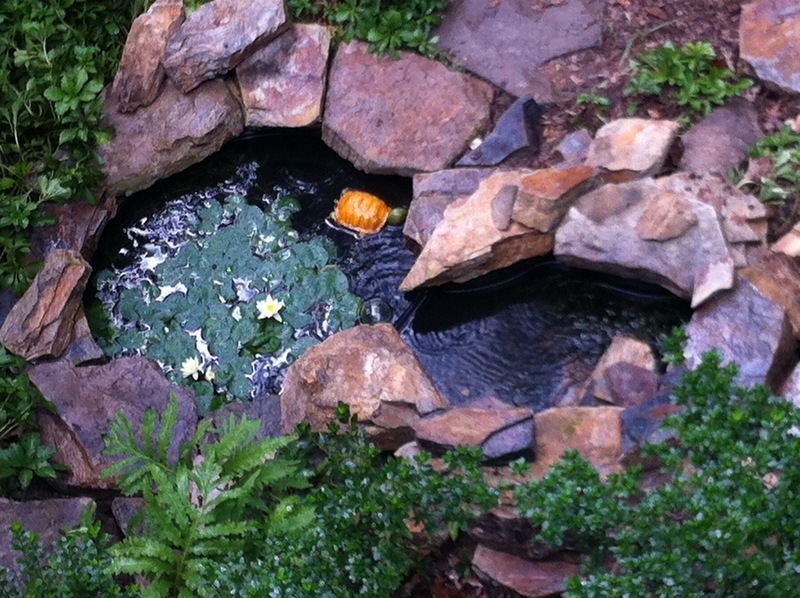 As soon as I had filled the pond half-full and was testing out the waterfall, that frog, hiding patiently in the bushes nearby, suddenly jumped back into the pond for good. Just couldn’t wait until the pond was completed to get back into the water. Gotta love Nature! It was time to set some boulders and stones around the edge of the pond as the leopard frog watched me with interest from the circular pond. 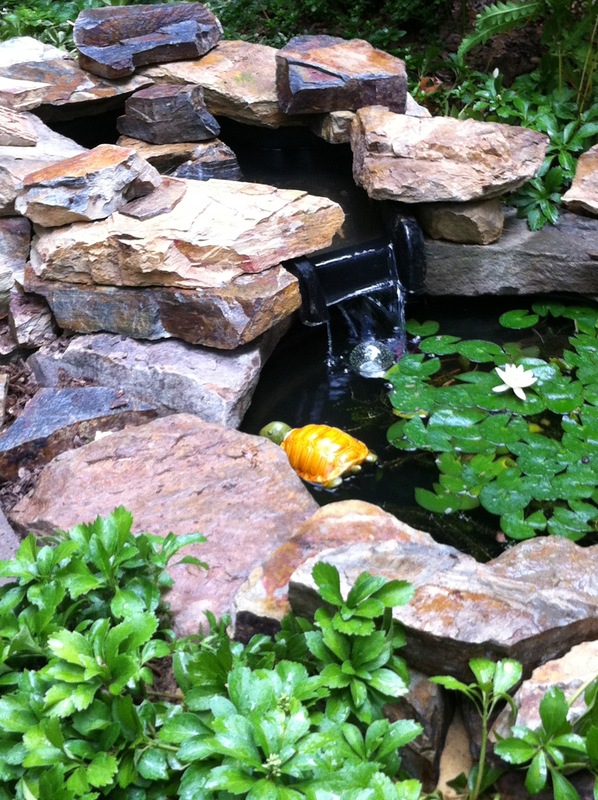 The goal is to try to hide the edge of the plastic liner with the boulders including a little overhang into the pond for a natural look. Try to use stones and boulders that have a large enough footprint that they won’t fall into the pond on their own if nudged or stepped on. And of course, both my gardening cart and the Kubota tractor came in handy for moving the boulders and stones. Some stones are much heavier than others and not by size necessarily. Since I like to change things around, I don’t usually use mortar or adhesive unless necessary, I tend to dry stack my boulders and stones. We don’t have little children around so not much chance that little feet will slip into a pond. If you have little ones, please take extra precaution to seat your boulders well, and glue or mortar your stones together so there will be no accidents. 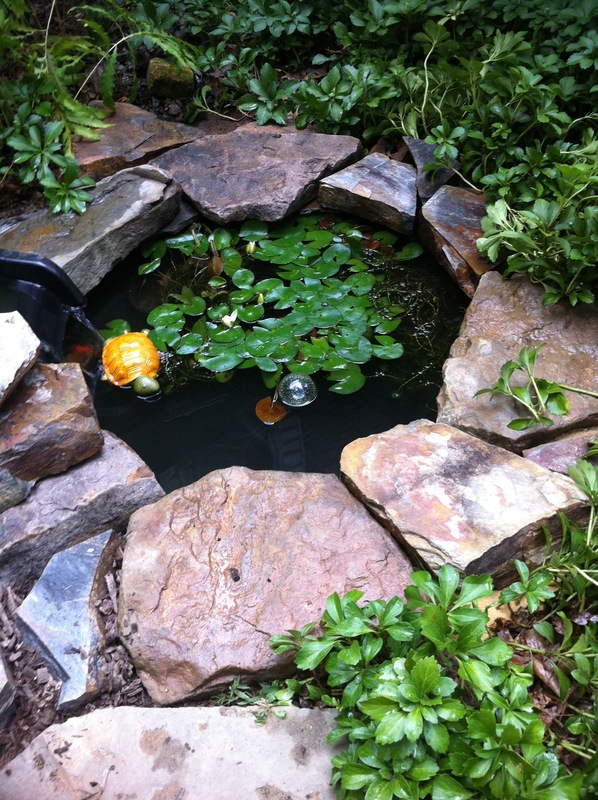 After I was satisfied with the way that the circular pond looked, and because I was running out of daylight, I put about a quarter of the original pond water back into the pond to help maintain the pond’s environment. Added some more clean water as well. The water lily plant went back in and immediately spread out. And then the three fish and the small fry went back into the much cleaner water. The fish immediately swam around and definitely looked happier. Funny what fresh clean water will do for our aquatic friends. The water lily plant tends to prefer still water so I hope it’s just as happy with a little bit of water movement. The dwarf water lily , a yellow nymphea, has done well this summer boasting a lot of showy yellow flowers which only open during the day. The next morning, I started to stack the remaining boulders and stones around the higher waterfall area. It’s like a puzzle, finding boulders the correct size and ensuring a good fit. Your local raccoon family can move more heavy objects than you would expect — so ensure nothing wobbles or they will find and move it for you. I guarantee it. Just as I was stacking the last stone, Mother Nature sent us some much-needed rain showers. Perfect timing! 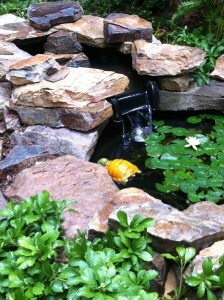 And lastly, I glued two smaller stone shards to the waterfall downspout area to finish the look. What a difference in look from the original pond! Almost finished! Just need to add two pieces to the water spout. Starting with the same circular pond liner — see how very different a project can turn out with a separate set of finishing materials and a modified footprint. This was just a weekend project for me. 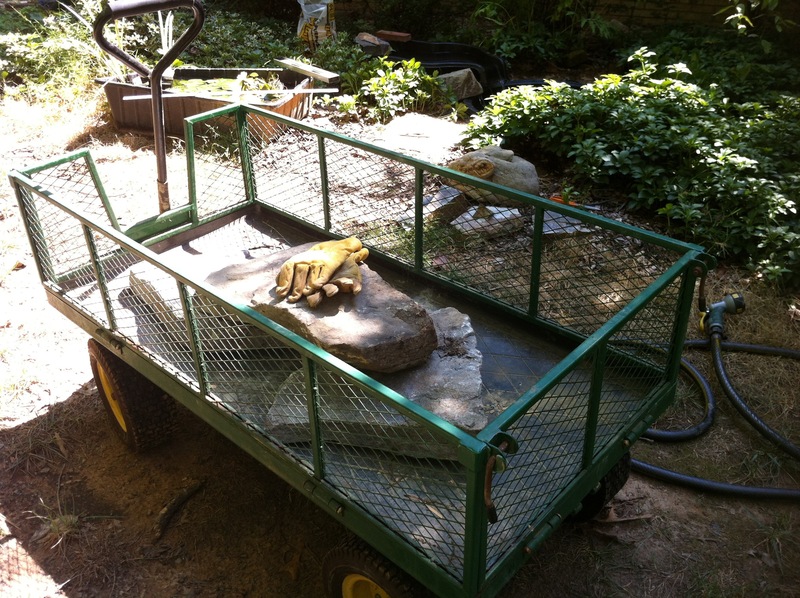 Since I already had the boulders and stone, the existing circular pond already installed, the waterfall liner, and only had to order the pump/filter system, it was basically assembling the mix. I did get help from my husband with the Kubota tractor to move some of the larger boulders. For you, it might be a two-weekend project. I added a week or so of thinking and planning the design outcome. The thinking and planning time is very important, especially if you haven’t taken on a project like this before. Water gardening is easy! If I can do it, you can do it! Try the same on your own, and let me know how it goes for you. 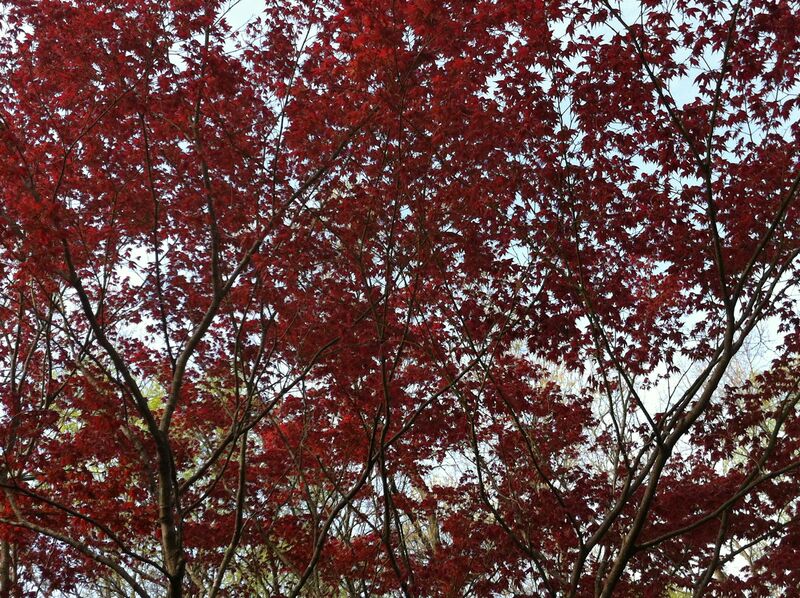 UPDATE: April 2013…. 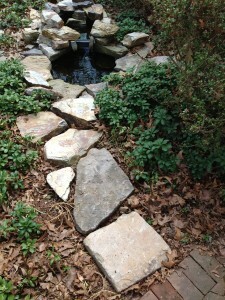 I realized that I could not see the front pond very easily when walking up our front walk to the house, so I added some boulders for a kind of stone walkway. Much better now. Even gave the existing pachysandra that was removed to a local FreeCycler for her garden! I highly recommend the FreeCycle organization in our Northern Virginia area, although I believe it is nationwide. Check out their website for more information. 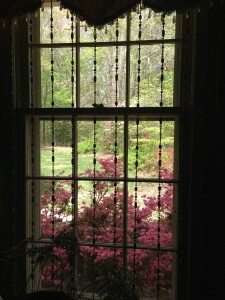 Join the Gardening Craze! Even Mickey and Minnie Mouse Have Their Own Gardens! 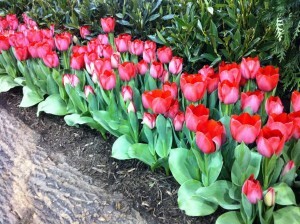 It’s Time to Plant Bulbs for Spring Color!